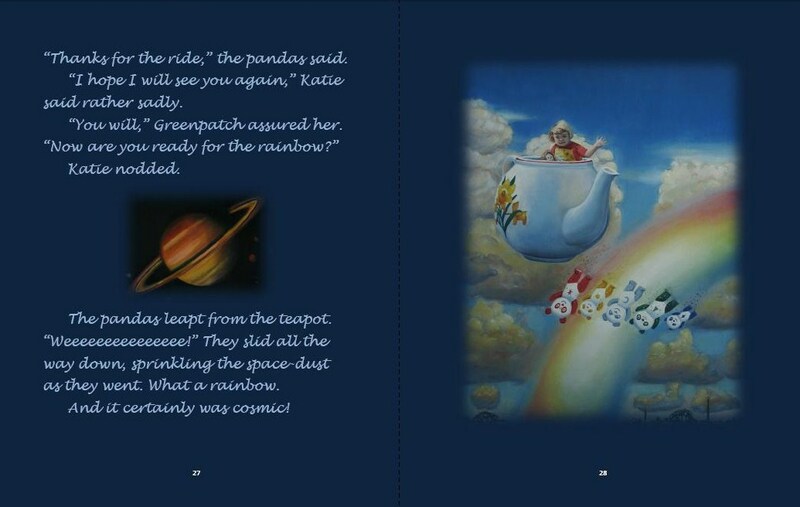 This picture book for young children, Katie and the Cosmic Pandas’ Deep Sea Voyage, follows my first story, Katie’s Magic Teapot and the Cosmic Pandas, where Katie and her friends explore the oceans to meet some very odd creatures indeed. I wrote and illustrated this children’s educational book to create a book I would have liked as a young child. 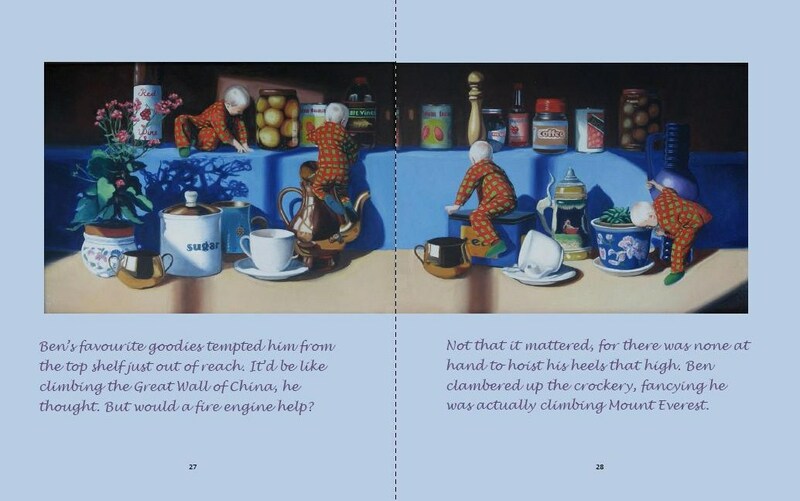 The book is brimming with full colour illustrations, all of which are completed in oils. 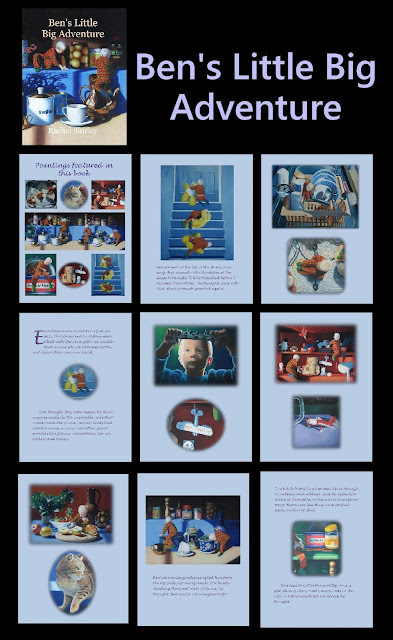 I wanted to create a visual feast that not only diverts the child, but educates. What better way than juxtaposing a magic teapot, colourful pandas and a young girl against the weird creatures of our oceans? Katie has a secret. Mummy’s teapot is no ordinary teapot. 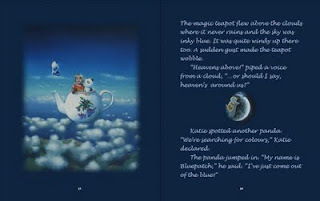 Not only has its spout poured rivers of tea, the teapot can also fly. 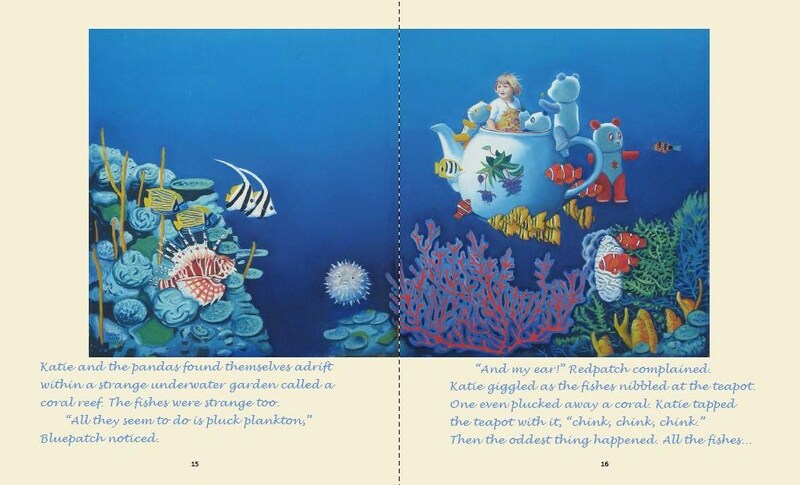 One day, Katie took the teapot with her to the seaside. 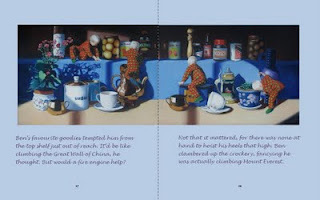 Shells and teapots were alike, she noticed. Both were hollow and made a ‘chink’ sound when you tapped them. 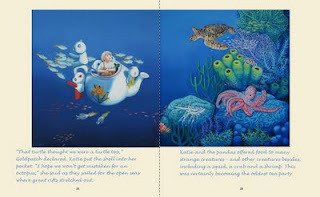 If you held a shell to your ear, a hushing sound like the sea could be heard. Katie’s friends the Cosmic Pandas had appeared on the china and they were popping out onto the sand! ‘Oh, joy what a glorious day!’ They danced and leapt about. ‘Come on, chop, chop!’ Greenpatch rallied, ‘time and tide waits for no panda!’ The five of them leapt inside. ‘We might find pirate ships in its watery depths,’ Silverpatch crooned. ‘I want to find something for mummy and daddy,’ Katie announced climbing in. 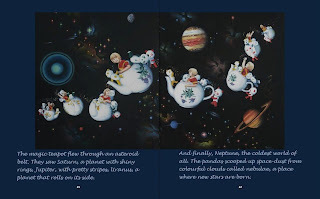 And with that, the teapot took off for the sea. ‘Whoa!’ they cried. Katie and the pandas dive deep under water to encounter a school of fish, a manta ray, dolphins, a coral reef, penguins, a turtle and delve deeper still to discover an array of weird glowing creatures. But do they find treasure? Well, not as you’d expect. 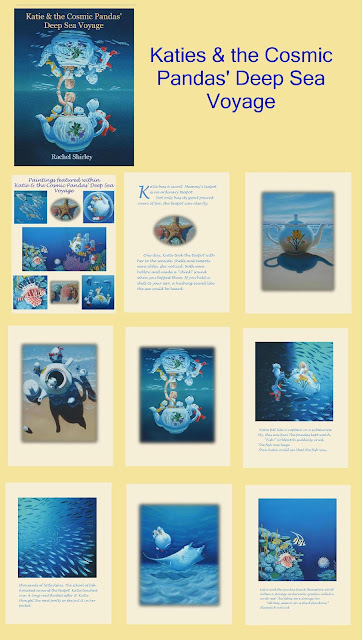 This great kid’s book educates youngsters about the creatures of our oceans, via colourful illustration and a play on words. It has taken me around three months to paint the detail on the original images, all of which measure 15x12in (the double images were 15x24in). A creative but exhausting experience, I am certain it has been worth the effort. 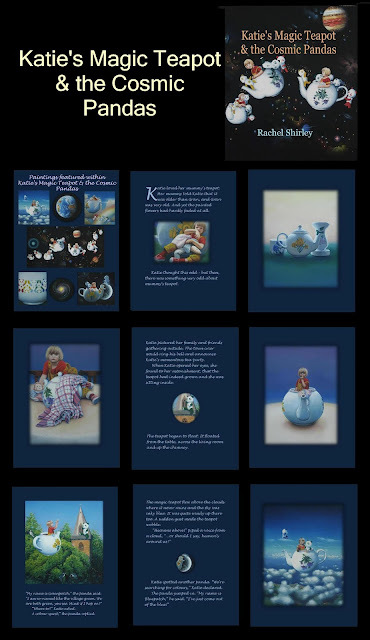 Screenshots of the print version’s pages serve to inform on the look of my picture book’s interior. My book is available both as a print copy and on Kindle. The hardcopy is a standard picture book size, being 32 pages long, around 1000 word and measures 8x10in. Colourful detailed images ensure young kids remain captivated by the story and urge a curiosity to find out what awaits on the next page. I have published Katie's Magic Teapot Omnibus Edition, of both stories Katie's Magic Teapot & the Cosmic Pandas, and Katie & the Cosmic Pandas' Deep Sea Voyage, making this a little cheapter than purchasing the 2 stories separately. Ben's Little Big Adventure book might be alternative for boys.